Butternut gives this kitchari some sweet creaminess, almost like you have added some sweet cream butter, and is the perfect complement to the slight bitterness of the greens. This recipe is great for kids (or adults) who are not fond of seedy spices in their meal. 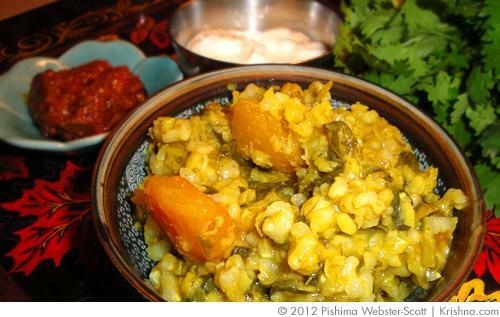 My daughter loves this kitchari and I love that she is eating healthy whole grains and vegetables. Wash the mixed greens thoroughly a few times to remove all of the dirt. Chop the washed greens into smallish strips. Peel and chop the butternut into 1 inch cubes. Set the greens and squash aside and wash the rice and dahl. I wash them together to save time. Place a large pot on medium heat and add the rice, dahl and water. If you wish to save time you can pre-boil your water (and electric kettle is great for this sort of thing). Bring to a boil and then add all of the spices and the butternut cubes. Let cook for a while stirring occasionally to prevent sticking. After about 20 minutes add the greens and salt and keep cooking. Turn the heat to med/low and add 1 more cup of water. Let it gently boil for about 40 more minutes with the occasional stir or until the rice and dahl are fully cooked, the brown rice will still not be completely soft. Serve with a knob of butter or with some yoghurt and your favorite pickle. Submitted by Anonymous on Fri, 06/08/2012 - 08:54. I did a lot of your recipes and they are all great spieacly the vegie buger since it taste great and take no time to make. The ready made at the store taste awful are unhealty and they cost 6$ for 4 quite a shame, since i am vegan i mostly eat veggie burger when i am invited to bbq. Anyway you really did teach me how to cook vegan food, thanks for that your the best!